The pedestrian border-wait line at the San Ysidro crossing is like the longest line in an amusement park…only you reach the end and find out that there is no roller-coaster. There is usually no one smiling while waiting to cross. People stand in the sun, suffering in their own way. Mothers juggle their children and luggage, workers impatiently try to find ways to make their wait shorter so they don't get fired, party people stand like zombies, and even crazy homeless people wearing half a shoe stand in their own world, smoking cigarette butts found on the ground. On top of all that, there are vendors, drunk musicians, and blind beggars walking in between, everyone asking for spare change. All of this is enough for you to not notice the horrible stench coming from puddles of filth under the bridge. Complaints about the conditions fell on deaf ears. La linea just became a thing you had to deal with. Tired of the inhumane travel conditions, Monica Schroeder set off to research the border-crossing experience, not knowing what she would do with her findings. Monica was born in San Diego in 1986 and moved to Mexico City when she was ten years old. Her family has had the opportunity to travel to many countries around the world. She has never experienced conditions like the ones found at the San Ysidro border. It has been one year since Schroeder started TJTQ in a small border shop. The space provides tired travelers basic necessities, such as a place to sit in the cool shade and space for children to play and draw. Inspired by a global movement named “Before I Die” by Candy Chang, a blackboard wall lets people write down what they want from their city. The project is mostly funded from Schroeder's own pocket as well as family and friends. 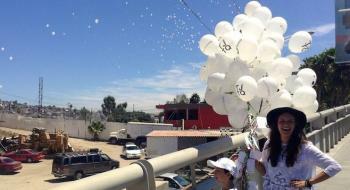 To celebrate the one-year anniversary on August 23, 10,000 white balloons with the hashtag #BorderUnity were given away and released into the sky. Schroeder met with Border Patrol officials prior to the event to inform them about the balloon release. Northwest to southeast wind, power lines, and confusion as to when to release the balloons ruined what could have been a great spectacle — all the balloons quickly flew in the opposite direction of the border. Schroeder's optimism and smile were not affected. When Schroeder is not at the border, she pushes reform to both the American and Mexican governments. The next stage is collaborating with industrial design students to create the most efficient roof ever! We could transform the pedestrians' worst enemy, the sun, into a power source to light up the night. Our negotiations include getting written permission from Baja's state government to build improvements. Once we have the required permits and the design we'll have a fundraiser.